Such a string of dizzyingly beautiful days, all in a row, have graced the end of May. It's the perfect time for me to get back into running in a big way. So much has been going on. I'm feeling pulled in many directions. When I feel like that I have to take a few hours each day for my body and spirit. It's always more than worth the time. Saving oneself, always worth it. :) What's that they say about the oxygen mask? You put yours on first, and then help your kids with theirs. It's not a selfish thing. It's how it's done. I never know where I'm headed until faced with the decision at the T intersection at the end of the driveway, then at the end of the township road. Regular route or long run? 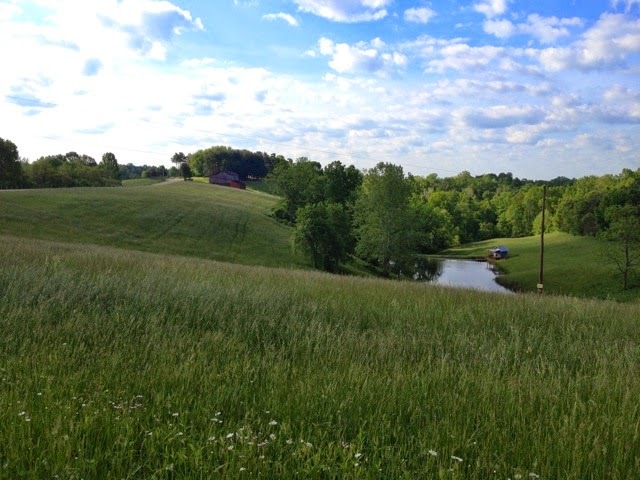 If a long run, to the old farmstead or down Dean's Fork? 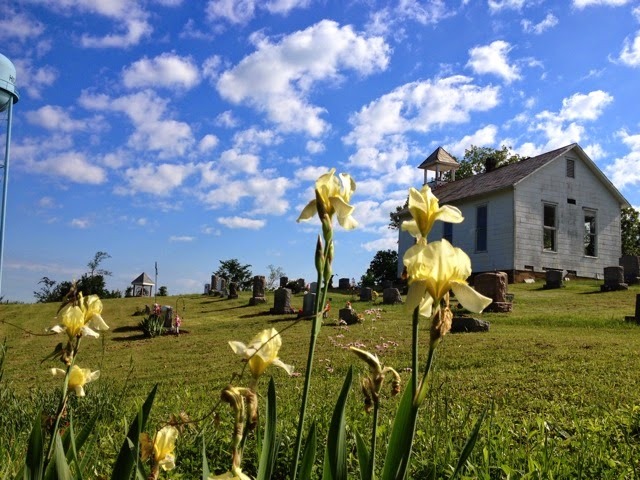 Off to visit the grasshopper sparrow, the red-spotted newt pond, the bluebird trail or the Waxler Church? How about all of them? There are destinations, and decisions must be made. As always, my hardy companion leads the way. 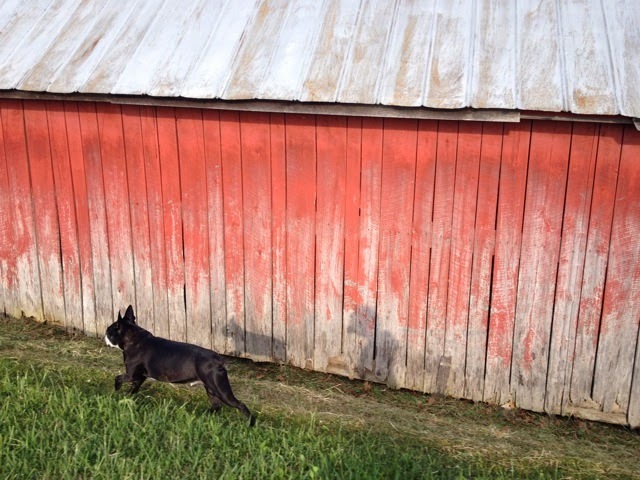 He deeply appreciates the long runs, the new places, and he'll take the lead instead of lagging behind. Dogs get bored with routine, too! I feel incredibly blessed to have so many different possible outcomes to a morning's jog, all reachable on foot. It pains me to think of the years I did not explore my little patch, the years I wore a rut in the same 45-minute hike around our land. And yet I got a book (Letters from Eden) out of that, and that route I called The Loop seemed incredibly rich to me then, tied as I was to nap and meal schedules for the kids when they were little. My mind and horizons have expanded some since those infant and toddler days. I now have a 7-mile radius that I explore, which is still a fairly modest home range for a large omnivore. How lucky I am to have this vista to contemplate! 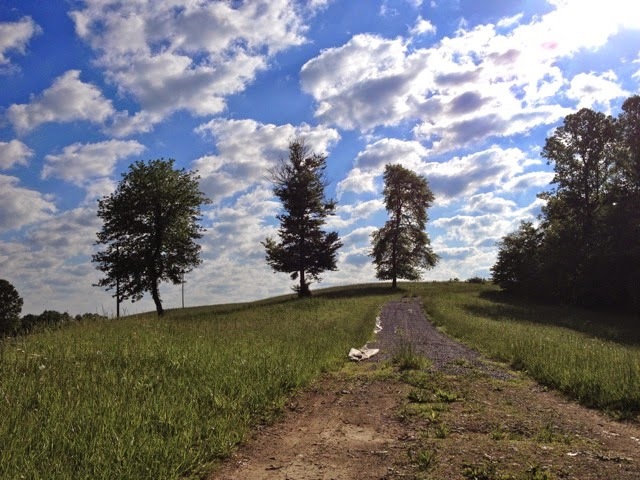 The hill's bowl acts as a perfect amphitheater for birdsong. By the time I reach here, only 1.3 miles from home, I'm usually up into the 50's on my bird species count. It's a game I play. I let the birdsong pull me along. I know where I can "get" each species, and I wait to hear them call or sing. It may seem silly, but as a result of this little game, I have an incredibly detailed mental picture of exactly what species breed where in this landscape. I usually beat 60 in May, and may hit 72 before the day is over. Huzzah! I think one could do this almost anywhere, map a series of runs or walking routes. 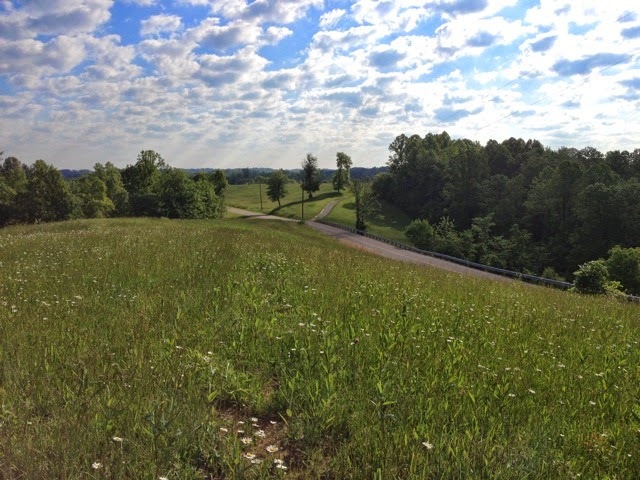 My home in Appalachian Ohio just happens to be a place where the routes are painfully beautiful, especially in May. 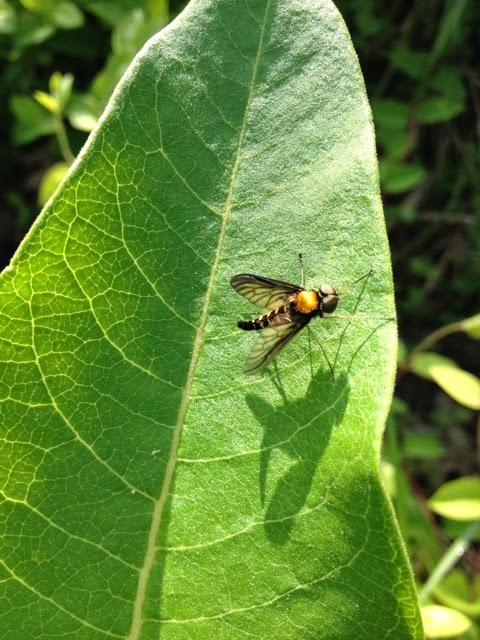 A golden--backed snipe fly, Chrysopilus thoracicus. It's always a good omen for me. They're my little F-16's, bejeweled fighter planes. Predatory on other insects. Often found coupling on sunny mornings on the ground or low leaves. Luucky. He's got a scary monster shadow, this one. 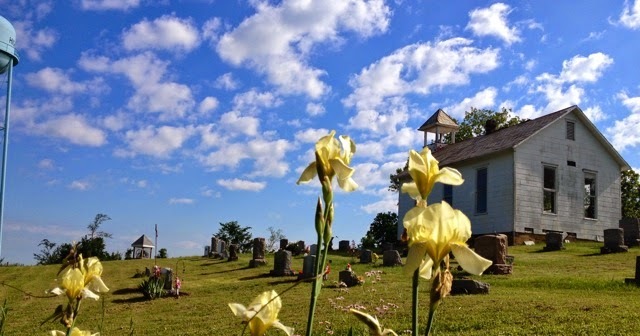 I stop to inhale the grapey aroma of Mr. Funk's irises, and remember that it is high peony time, and I have some peonies to visit at the Waxler cemetery. Old peonies, maybe special ones. 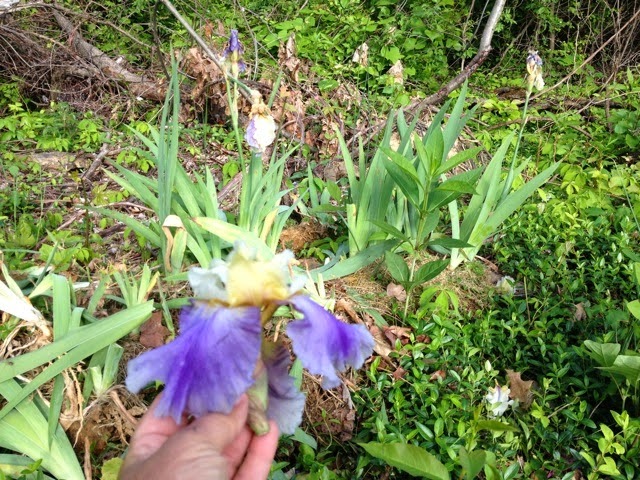 The first thing I find is some iris that have been discarded, probably from graves, off to the side. Oh, how sad. They're lovely. But probably too weedy and too much work for whomever maintains the cemetery to bother with. Lifting iris every year to get the weeds out of them is a huge drag. Which is why the only iris I currently grow are the slim dark blue Siberians. I'll think about adopting a few of these waifs. I like plants with history. 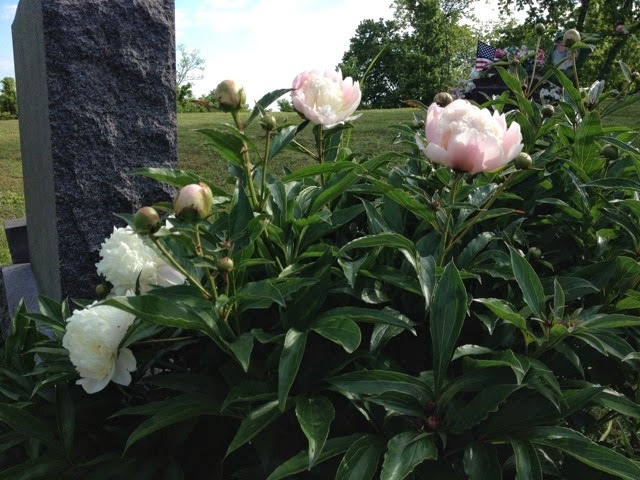 The Stauch peony is out, and it's just like my heirloom from Dean's Fork. A shell-pink outer ring of petals, and a rose-scented white pouf in the middle. Mmmm. No need to come get an eye off that one. I've got two at home. The Bruny peony isn't out yet. I can't wait to see what it will be. Probably like the medium pinks I have at home. But you never know. And then there's Peter Gruber's peony. Might be the same as the Bruny peony. But again...the mystery pulls me along. They're not out yet. I'll have to come back. Darn. I remember I need to visit Ada Hune, my friend, forever 14. I tell her her rose is leafing out, despite the horrible winter it endured. I tell her about the indigo bunting that's singing nearby, whose mate probably built last year's nest that's peeking over the left corner of her stone. I kneel to shoot a photo and go on exploring without looking at it. And Ada sends me a sign. Once again, I don't see it until I get home and upload the photos. 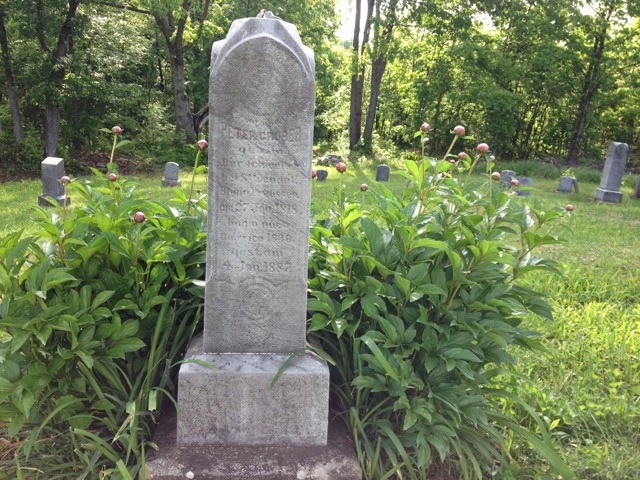 Five pink orbs that I definitely did not perceive as I looked steadily at her headstone. The granite is dull. It's not reflective at all. The lights are simply there, dancing on its surface, perhaps for only my iPhone to see. Lucy from Minnesota looked at this and says Ada may be sending me a sign that she and her family are with me as Phoebe prepares to leave. It's one interpretation, and I trust Lucy, but I can't be sure what it means. Maybe she's just telling me the Peter Gruber peony will be pink. 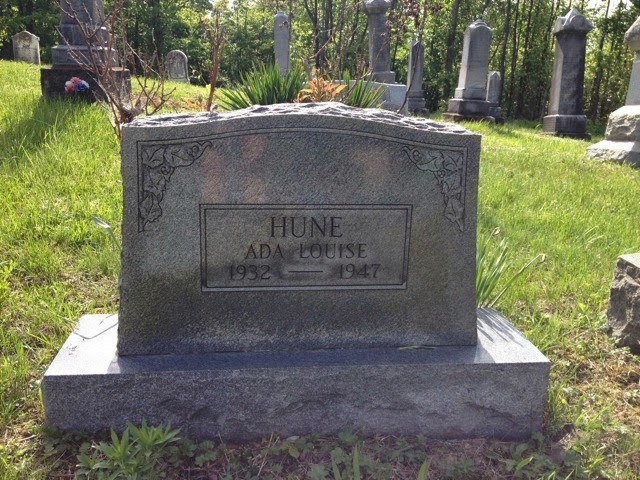 There is something very special going on at Waxler Church Cemetery with me and Ada Hune. Why I am privileged to behold this phenomenon I don't understand. Maybe it's because I stopped to talk with her in the first place. I never have the hubris to expect it. Like the song of a grasshopper sparrow in an unexpected place, it happens or it doesn't, and I'm thankful either way. I turn around and see some cornsilk yellow iris, also discarded in the back lot. I see a photo there. It's as if the tableaux wait for me, for the perfect day, the perfect light, and reveal themselves. My spirit, kept wide open to the thrust of grace. Nothing in my head but the beauty, flowing over and around me. It's a peace that goes beyond describing. It has nothing to do with anything, but it is essential for me to imbibe, so I can keep going with all I have to handle. The oxygen mask, descending mysteriously from above. I don't know how I would survive without all this useless and utterly essential beauty. I still haven't cut that piece of white landscape fabric. It's part of the composition now. I'm starting to like it. On the way home I climb the high hill where the grasshopper sparrow has been singing for more than a week now. And he's singing still. I look down on The Three Graces dancing far below, and know that, at least for me, it doesn't get any better than this. A grasshopper sparrow, a hilltop, three graceful trees, those ranks of clouds, marching away into forever. My home is way out there, where the horizon goes white. But my home is here, too, in these places that sustain me. It suddenly hit me as to why Ada would manifest her presence to you: You and she are kindred spirits. You both feel the same way about the land you live on, and she no doubt visits it quite frequently. She knows that you feel the same love for the land that she does, and she wants you to know that she hears you and appreciates your love for both the land and for her. First off--no such thing as useless beauty. But you know that. All our posts speak to me, but this one especially. I would give anything to have your ears for birds. I would give anything to have joints that allowed me to sneak out there and go for a run with you. 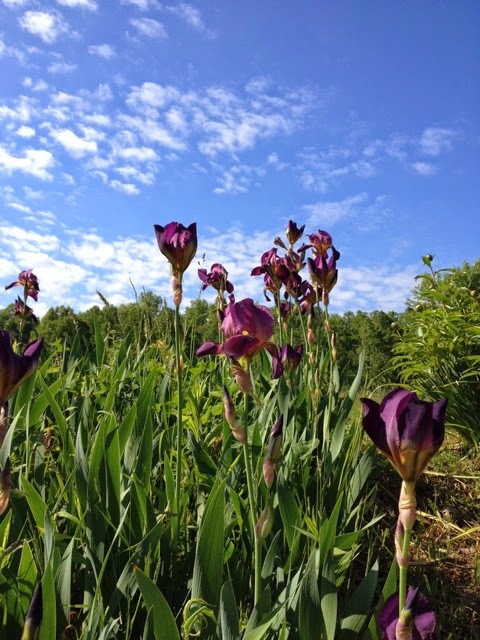 And I love when we have parallel beauty going on in our lives--iris up, peonies a'comin. Breathe deep from that oxygen mask of yours. And yes, take good care of yourself, dear JZ. Oh Julie- you make my heart sing when you share your days, thank you. You have a way of touching the soft spot in my heart. Beautiful words and feelings always. Bless you. Sometimes I feel like I just watched a touching,funny and inspiring short film when you write like this. I often watch it twice. The beautiful words and images follow me into the day, and sometimes to places outside I never would have ventured if I hadn't met you and Chet. It doesn't take long before I can hear the soundtrack. Your comment,"It happens or it doesn't, I am thankful either way",is so poignant. That and your quirky,(but delightful), sense humor is probably why you attract so many interesting characters on this side,and the other. I wish I could use words as beautifully as you to express how you lift my soul and inspire me to be a better person. I love that you stop and talk to Ada! I love old cemeteries. There is one at the end of my road this I visit quite often. 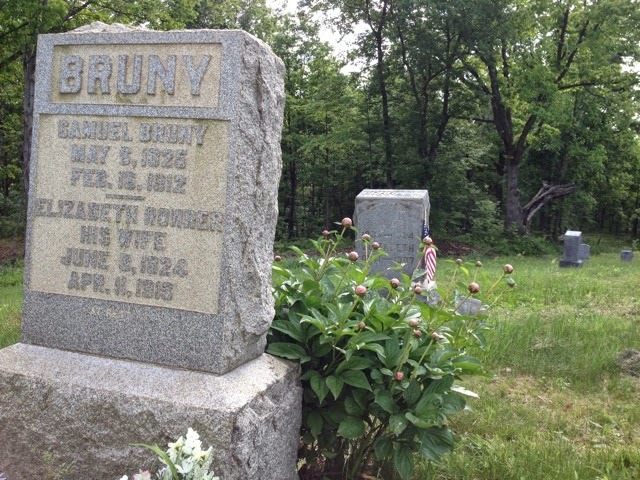 When doing family research, I discovered my g-g-g grandfather is buried there. Thanks for the beautiful walk. You've inspired me to take longer walks & change things up and maybe take a different route once in awhile. That's an amazing day count you have. I've only tallied 126 since January here in south Mississippi. I like your work. I found your blog in my meanderings from a link to your essay on the Ivory-billed Woodpecker, which was a great read with some excellent observations on the "peeling" method used by the species as it feeds. there is lots about the Waxlers too... probably some geneological stuff in your local library... 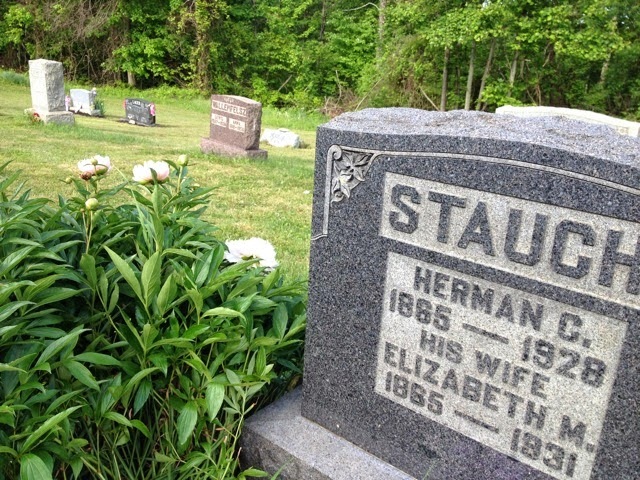 It looks as if Herman and Alma lived into their 80's... one died in 1988, so there should be some info around if you really want to find things out.